Can Warren and Pelosi Lead Democrats to High Ground? The congressional showdown has given us an exciting glimpse of what the future might look like if they lead the way for a liberal insurgency. The sordid business of closing out the do-nothing 113 Congress—giving the Wall Street bankers one more bite of the apple and a friendly kiss for the CIA torturers—has stained President Obama indelibly. We will never forget what he did and failed to do. He deserves our contempt. The president marginalized himself with his unreliable weakness. The recent events in Washington are nonetheless clarifying. They tell us that the worst is yet to come. When McConnell-Boehner take charge of Congress in the New Year, the president will be standing with them on the wrong side of some fundamental issues, ready to make bad deals with the Republican wrecking crew. In the past week, he lamely allowed the CIA to carry on as though the criminal behavior of torturers was merely a policy mistake. He called them “patriots.” History will recognize this is a damaging lie that undermines our nation’s values, not to mention our reputation. Simultaneously, Obama collaborated in the piecemeal destruction of his own financial reform legislation. His White House advisers are no doubt surprised by the bitter objections, since they are Wall Street–trained themselves and think it is no big deal to give a regulatory break to JPMorgan Chase, Citigroup and other malefactors of wealth. Besides, they explain, the president got more money for little children and the poor. Obama will doubtless make other bad trade-offs in the final two years of his presidency, but he has already defined his own irrelevance. Harry Reid and Mitch McConnell will do the deal-making between them, joined by House Speaker John Boehner and a few old salty dogs from both parties. The president will be kept informed. At every step, he will tell himself this was the best he could get. 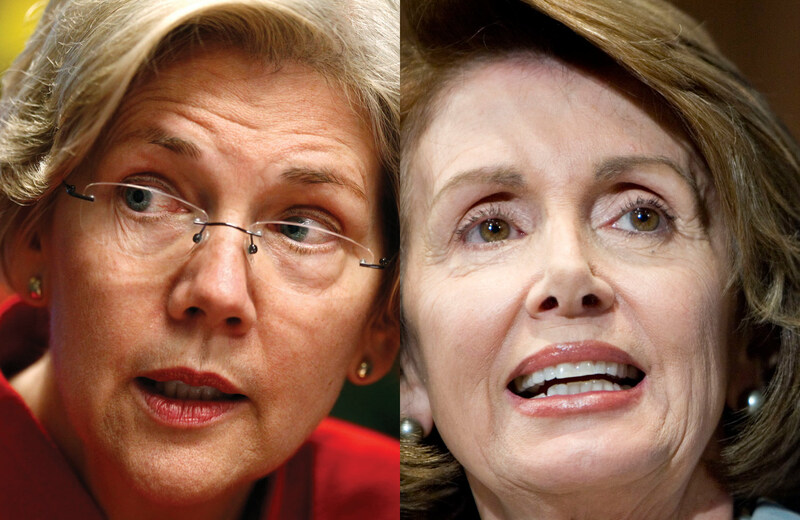 The congressional showdown, however, has given us an exciting glimpse of what the future might look like if Representative Nancy Pelosi and Senator Elizabeth Warren lead the way for a liberal insurgency. Both stood up and fired back at the stink of what Obama and many Dems had accepted. Warren and Pelosi did not personally attack their party’s doggedly passive president. But both essentially declared their independence from him. Their willingness to confront and counter the cynicism that passes for policy debate is a hopeful marker for larger change ahead. Their independent-minded opposition could be the start of something big now that the Dem party is in the wilderness again, wondering why they aren’t loved. Senator Warren has been trying to tell them for years. Pelosi is a team player who in the past went along with the Obama White House when she should have rebelled. Maybe the public will now hear more of her eloquent dissents. .
It’s a starting point only. No one should imagine either Pelosi and Warren or other like-minded Democrats have an army ready to march and restore meaning to the Democratic party. What they do have, however, makes them potentially powerful. They have authenticity and sophisticated knowledge. In different ways, both know how the corrupted political system does great damage to American life. It makes them disgusted too.